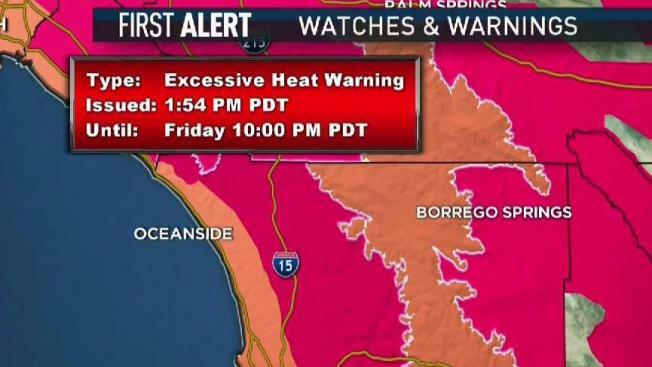 In San Diego County, residents may see high temperatures between 98 to 108 degrees. An excessive heat warning was issued Monday for San Diego, Riverside, and Imperial counties. The warning is effective from 10 a.m. Monday to 10 p.m. Wednesday. In San Diego County, residents may see high temperatures between 98 to 108 degrees. Communities affected include Escondido, El Cajon, San Marcos, La Mesa, Santee, and Poway, according to the National Weather Service. The City of Poway closed its popular hiking trails to dissuade people from hiking in the heat of the day. Even coastal areas were under a heat advisory with temperatures expected in the mid-80s, she said. In southeast California, including the Imperial Valley and the lower elevations of Joshua Tree National Park, temperatures are expected to reach highs of 108 to 115 degrees. To avoid heat exhaustion, stay in an air-conditioned area during the hottest hours of the day. For those people who live without air conditioning, the county has made "Cool Zones" available. Here's a list of current locations that will provide relief from the heat. They include libraries and recreational centers across the county. Other tips to avoid heat exhaustion include taking cool showers, drinking plenty of water and avoiding any unnecessary work or exercise outside. Dizziness, nausea, confusion, and headache are signs of heat stroke or exhaustion. If someone begins to show these signs, move them to a shaded area, cool them by fanning them or spraying them with cool water. Do not give the victim fluids and call for help. The hot weather is expected until Thursday.